Poetry. Paper, perfect bound, 92 pp. Also available in laminated hardcover. Howard Schwartz is a contemporary master of the parable, the short lyric and the tale. 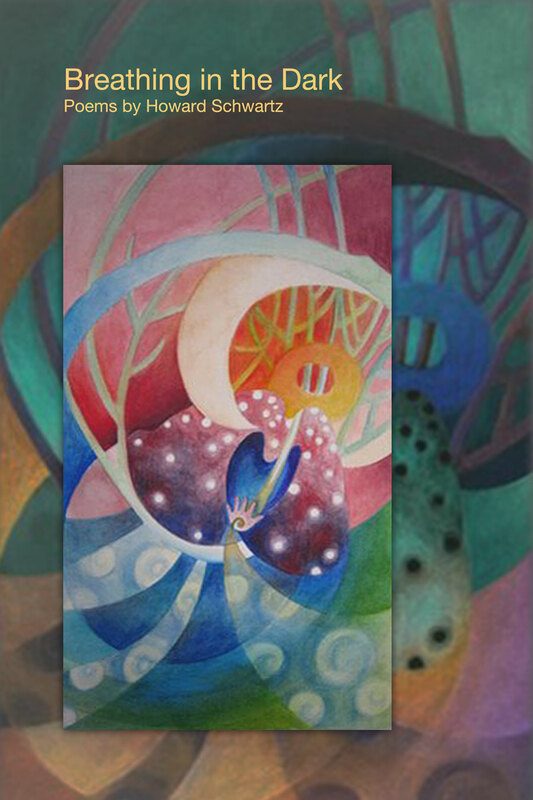 In Breathing in the Dark, he has multiplied his dreams, his myths, and his stories into poems that grow quietly and firmly from the secret root stock of his imagination. That side of Judaism and that side of poetry which is dream-like, mythical, and memory-ridden is Schwartz’s domain. Breathing in the Dark is a book of human tenderness, gentle humor, and more than a dash of mysticism. To read these poems is to enter a state of meditation in which the two worlds of ordinary life and that of spirit are combined. Breathing in the Dark is a book of human tenderness, gentle humor, and more than a dash of mysticism. Howard Schwartz is a poet who has breathed in a lifetime of experience, and breathes out a lifetime of wisdom. To read his poems is to enter a state of meditation in which the two worlds of ordinary life and that of spirit are combined. – Alicia Ostriker, author of The Volcano Sequence. I resist blurbs, but this book is something else. It distills such poetic wisdom and wry sly Kafkaesque twists and turns, it’s as if it comes from another time and place and yet is immediately relevant. Noted folklorist with a secret poet’s life, he opens it all up in this splendid gathering. Simple tale telling & dream-telling that gets to the core of mysteries. Clear and mysterious, ironic and accepting. Absolutely lovely. – David Meltzer, author of David’s Copy. Howard Schwartz is a well known and beloved poet, storyteller and anthologist, a student of myth, and prolific dreamer. His poems navigate between the hard truths of family and the fluidity of the dream. Schwartz has multiplied his dreams, his myths, his stories into poems that grow quietly and firmly from the secret root stock of his imagination. “Breathing in the dark” with Howard Schwartz, I feel I am at the place where words begin and end, and I am grateful to be there with him. – Rodger Kamenetz, author of The Lowercase Jew. Howard Schwartz is a contemporary master of the parable, the short lyric and the tale. In his new book, Breathing in the Dark, he has found a way to balance the communal and autobiographical, the family and the tribe, dream and waking life with his passion for forms that explore the fabulous. Here are sacred words passed down to us from our parents, who are prophets and seers. The poet connects our ancient past to contemporary life, the lyricism of the psalms to the words spoken by a father to his son, the songs of David to the voices of Coltrane and Amichai. Breathing in the Dark opens a new chapter in an already distinguished poetic career. – Jeff Friedman, author of Taking Down the Angel. and tried to get there by sea. will roll to that city. 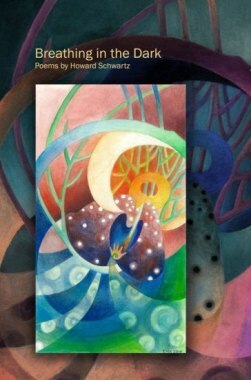 Howard Schwartz is the author of four books of poems, Vessels, Gathering the Sparks, Sleepwalking Beneath the Stars, and Breathing in the Dark. He is also the co-editor (with Anthony Rudolf) of Voices Within the Ark: The Modern Jewish Poets. His other books include Tree of Souls: The Mythology of Judaism, which won the National Jewish Book Award in 2005, and Leaves from the Garden of Eden: One Hundred Classic Jewish Tales, published in 2008.
every branch of the tree of life. The “you” is left ambiguous here. Is it the poet’s self? The reader? Everyman? This adds to the mystery of the work. first at every estate sale. but I will always be with you. I take you for a walk in the forest. “Shadows and light.” This sums up my impression of “breathing in the dark.” We all know what shadows are, and we know what light is. Howard Schwartz in BREATHING IN THE DARK gives them new nuances, new feelings, breathing a spir­itual breath into them. The author is genuinely steeped in cabbala, but you don’t have to be a cab­balist to read them. Like mythology in Yeats, the imagery of the holy book serves this poet well.